Duo Security is a SaaS authentication provider. This document will explain how to use Gluu's Duo interception script to configure the Gluu Server for a two-step authentication process with username and password as the first step, and Duo as the second step. In order to use this authentication mechanism your organization will need a Duo account and users will need to download the Duo mobile app. An account with Duo Security. Click Protect an Application and locate Web SDK in the applications list. Click Protect this Application to get your integration key, secret key, and API hostname. Generate an akey value for your instance. Learn more. For additional info on Duo's Web SDK, check this article. Follow the steps below to configure the Duo module in the oxTrust Admin GUI. Click on the Person Authentication tab. Now Duo is an available authentication mechanism for your Gluu Server. This means that, using OpenID Connect acr_values, applications can now request Duo authentication for users. To make sure Duo has been enabled successfully, you can check your Gluu Server's OpenID Connect configuration by navigating to the following URL: https://<hostname>/.well-known/openid-configuration. Find "acr_values_supported": and you should see "duo". 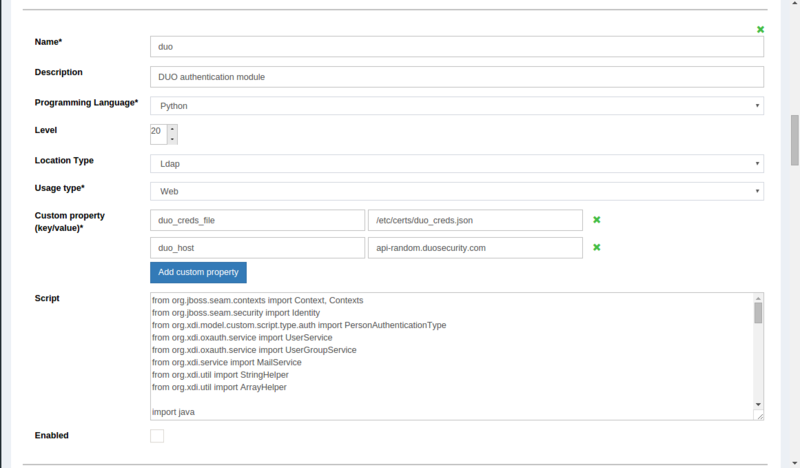 The oxTrust acr field controls the authentication mechanism that is presented to access the oxTrust dashboard GUI (the application you are in). The Default acr field controls the default authentication mechanism that is presented to users from all applications that leverage your Gluu Server for authentication. You can change one or both fields to Duo authentication as you see fit. If you want Duo to be the default authentication mechanism for access to oxTrust and all other applications that leverage your Gluu Server, change both fields to Duo.